Anthropologists working in southern France have concluded that a 1.5 metric ton block of engraved limestone constitutes the earliest evidence of wall art. Their research, reported in the most recent edition of the Proceedings of the National Academy of Sciences, shows the piece to be approximately 37,000 years old and offers rich evidence of the role art played in the daily lives of Early Aurignacian humans. In 2007, the team discovered an engraved block of limestone in what had been a rock shelter occupied by a group of Aurignacian reindeer hunters. Subsequent geological analysis revealed the ceiling had been about two meters above the floor on which the Aurignacians lived—within arms' reach.Using carbon dating, the researchers determined that both the engraved ceiling, which includes depictions of animals and geometric forms, and the other artifacts found on the living surface below were approximately 37,000 years old. "This art appears to be slightly older than the famous paintings from the Grotte Chauvet in southeastern France," explained White, referring to the cave paintings discovered in 1994. 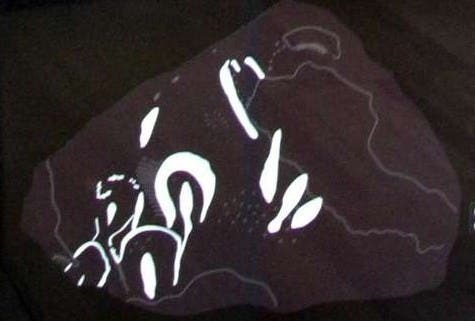 "But unlike the Chauvet paintings and engravings, which are deep underground and away from living areas, the engravings and paintings at Castanet are directly associated with everyday life, given their proximity to tools, fireplaces, bone and antler tool production, and ornament workshops." More information: “Context and dating of Aurignacian vulvar representations from Abri Castanet, France,” by Randall White et al. PNAS, 2012.